I've just put a few bits and pieces in my Commodore. Total noob question, sorry, I know very little about car audio. 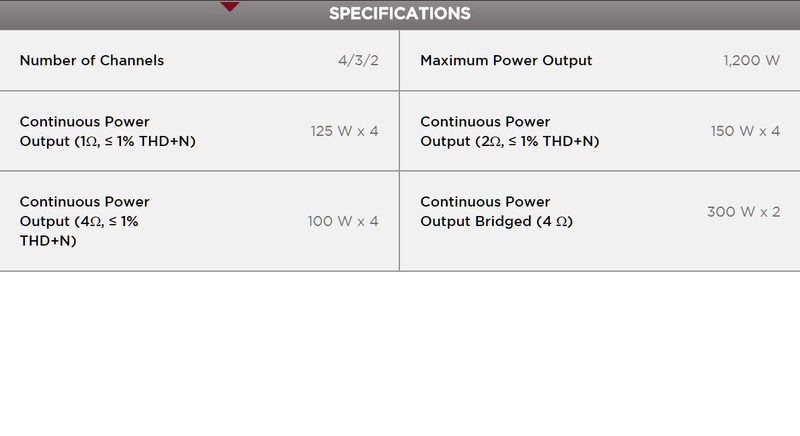 It seems that the amp can run 100w RMS x 4 at 4 ohms unbridged, it also says it can run 300w rms x2 at 4 ohms bridged. My question is can it run 100w RMS (for the splits) x 2 AND 300w RMS x 1 (bridged for the sub) ie. 3 channels? Do I need to do anything in particular to make this happen? Yes, you can do that. It will run the fronts at 100 watts x2 @ 4 ohms, and bridge the 2 rear channels to get 300x1 @ 4 ohms. There should be markings on the speaker connections at the amp to tell you where to hook up the + and - speaker wires for bridged mode. 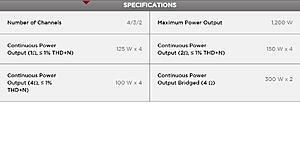 Any 4 ohm subwoofer will be compatible, including the one you listed. It should sound good, plenty of power, good equipment...just make sure you set your gains, cross overs, and any eq properly.